Learn more about web design and mobile development with us checkout web design in Perth. With Separation using these templating, then associate the workmanship design no longer bothered by the program code that you create. Likewise, do not worry any more script/program code that has been created will be uninterrupted. Sites with complex applications, such as a portal, it would require a complex script that spend up to thousands of lines. Of course it would be very burdensome if the script already dizzying it coupled with tag-an HTML tag in it. With the separation through a template, it can be done easily, even without having to remodel any PHP scripts. By compiling the views that exist, we can actually make a pretty powerful template library. The idea is simple; simply divide a page into several areas. As an example we will use a template from opendesign.org from design can be divided into the header area, top menu, right menu and content. Each area will be incorporated into sata whole page called templates. Each area will be handled by a view to avoid duplication and will facilitate the reuse area. As for proficiency level in these areas can be seen in the following figure. Template to be made is divided into four sections, namely Header (serves as a logo and slogan applications), Top menu (the main menu next above), Right Menu (additional navigation menu on the right) and the Content. This content area is often turned on each page. Note the display function; there are two parameters of the template and the data. Serves as data parameter data to be transmitted to the controller, While the template is the view that will be called to appear as the main content. This template will be divided into four areas: content, header, top menu, and the right menu. Each area is filled by a view (note the line-15, 17,19,21,23). Each view was loaded and stored in the memory, Then combined into a template (line 25). Functions that exist in this library we can actually add more, such as for seo, we want to manipulate the title and meta tags etc.. Library above is the simplest example when we want to create a template system itself. If you are exploring CodeIgniter for the very first time, you should start by reading the <a href="user_guide/">User Guide</a>. 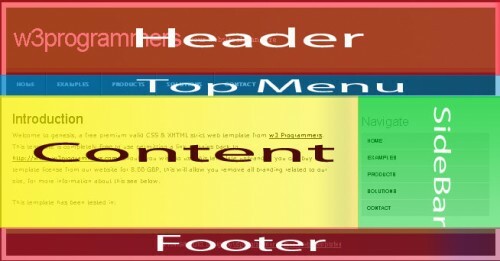 Once you have a view three areas (header, top menu, sidebar, content and footer) then we are ready to use template system. Next is to make a controller. In order to more easily manufacture the controller then just use the default controller of CodeIgniter, ie with minimal code changes to its controller. Note on line 13, where we load the libraries that have been made earlier. At line 15 and 23 we use the display to show the template. We should set up a view called WELCOME_MESSAGE. View will be placed on the content area. The content is the same view with the view in general. Hello, Your tutorial is very good. Do you tell me how to use that on my local server? when i run my local server I get the following error message “Fatal error: Cannot redeclare class Welcome in C:\wamp\www\ci2_template\application\views\welcome_message.php on line 27” As soon as please reply me. If any one here ple help me.. i’m not get the output of the template design. First of all crates ur project folder name at ur local server like xampp, wamp, Lamp or any server as u like. Thanks for this tutorial Masud bhai.. Works wonderfully. 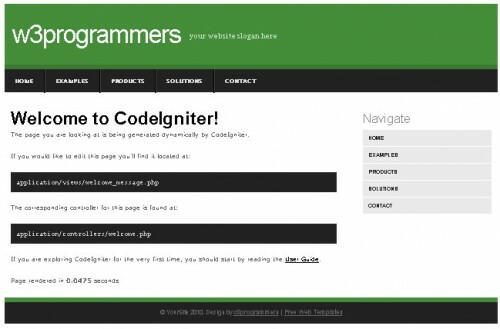 I was successfully apply your code igniter template and it was awesome. The next stuff is to add a page to display in the content portion in response what was click in the menu. Hi Masud.. i get all the code but the css tempalate doesn’t not appear..i donno why..
Hello Friends , Can You Send Me Source Code Please Help Me.